One of the most important marks of a person’s faith or commitment to a religious ideology is his readiness to defend that faith with life itself if necessary. Examples of such heroic sacrifice or martyrdom abound both in ancient and contemporary society. In ancient times, the heroic indifference of men like the Stoic philosopher Epictetus to torture and death in the affirmation of a noble ideal earned them the honor of martyrs. It was, moreover, their example and ideal of total indifference to passions and worldly life that provided a model for early Christian martyrs. In our own time, men like Che Guevara and his legendry comrade Tanya have been regarded as martyrs and even saints by some catholic leftist priests. Martyrdom has, their fore, been one of the most powerful instruments in the establishment and propagation of a faith or ideology and, hence, of a new social order. In this essay we shall examine the philosophy of martyrdom and the role of the martyrs in Christianity and Islam. We shall first consider this phenomenon in each of the two traditions separately and then briefly discuss similarities and differences of concept and attitude towards the martyr in the two communities. Our aim is essentially to appreciate the contribution which this phenomenon has made to the religion-political situation of today’s world. The term “martyr” as used in the New Testament means “witness”. It is, I believe, witness not to an idea but to an event, to the faith in the crucified and risen Christ. Thus the writer of I John writes, “… that which we have seen without eyes, which we have looked upon and touched with our hands … we proclaim also to you…” Likewise, the first Christian martyr Stephen is reported to have seen the heavens open and the Son of God seated at the right hand of God. It must, however, be observed that neither in the Old nor in the New Testament do we see any significant development of the concept beyond an almost juridical meaning of “witness”. In Biblical and post-Biblical Judaism, martyrdom was considered as an individual work of piety and resistance to evil. The cases of the woman with her seven sons in IV Maccabees (8:3ff.) and the three young man in Daniel (chapter 3) have survived as powerful symbols in the liturgy and hagiography of the Church. The aim of martyrdom in Judaism was essentially to perfect the victim and edify the people. Martyrdom, as a religious and moral concept, can best develop within an eschatological framework. It is significant, therefore, that in Judaism this concept appears only in late Biblical and apocryphal writing in an eschatological context. The early Church fell heir both to Jewish eschatology and its moral implications. In Acts 22:20, St Paul acknowledges his role in the martyrdom of early Christians, “When the blood of Thy servant Stephen was shed.” The book of Revelation, the apocalypse of the early Church, presents a vivid image of the martyrs: “I saw the woman drunk with the blood … of the martyrs”. Peter, who because of unrighteous jealously suffered not one or two but many trials, and having thus given his testimony went to the glorious place which was his due. Through jealousy and strife Paul showed the way the prize of endurance; seven times he was in bonds, he was exiled, he was stoned, he was a herald both in the East and in West, he gained the noble fame of his faith, he taught righteousness to all the world, and when he had reached the limits of the West he gave his testimony before the rulers, and thus passed from the world and was taken up into the Holy Place- the greatest example of endurance. One of the earliest and most eager martyrs of the Church was Ignatius, Bishop of Antioch (d. 108 A.D). For Ignatius, the martyr was “he who imitated Christ in His sufferings”. He therefore used the term “disciple” rather than “witness” His view was fully theological. Thus he insists on bodily suffering as a proof that Christ, the crucified Son of God, was clothed in a real body. Ignatius wished that his own body be crushed between the teeth of wild beasts so that he might become a perfect loaf for Christ whose own body is represented in the bread and wine of the Eucharist, and which is regarded by Ignatius as “the medicine of immorality”. In the account of the martyrdom of Polycarp, Bishop of Smyrna (circa 155 A.D.), witnessing faith to the humanity and suffering of the Son of God was fully developed as a concept. In the Leonine Letters (circa 170 A.D.) the term “martyr” signified persecution leading to the shedding of blood for Christ. Here the example of Stephen, who saw (witnessed) the glorified Christ before his death, was used as a proof case. The letters vehemently protest the use of the epithet “martyrs” for confessors who endured persecution but did not seal their testimony with their blood. In the Shepherd of Herma’s, this imitation Christ through martyrdom earns the martyrs salvation and a share in the glory of Christ. “Those who suffered for the name of the Son of God are glorious. All their sins have been taken away.” The martyrs are also pictured as sitting on thrones with crown on their heads, judging the world with Christ. The author of The Shepherd insists that this applies only to those who have suffered stripes, imprisonment, crucifixion and wild beasts for Christ’s name. It was natural that out of this great regard for martyrdom and the veneration accorded martyrs that a rich and elaborate culture should evolve. We can only discuss the beginnings of this culture and some of its salient features. It is reported that the authorities responsible for the execution by burning of Polycarp sought to prevent the Christians from gathering his remains which, they thought, they would venerate more than Christ. The faithful protested this accusation vehemently, arguing that the veneration with which martyrs are held on account of their sacrifice is not the same as worship, which belongs to God alone. The classic difference here stated and greatly elaborated in the Eastern Church is that between latria, honor or veneration, and doulia, worship. The parishioners of the Bishop did gather the bones of the saint for burial, which they considered “…to be more valuable than precious stones and finer than refined gold … (They) laid them in a suitable place. There the Lord will permit us (they said)… to gather together in joy and gladness and to celebrate the day of his martyrdom as a birthday, in memory of those athletes who have gone before…” The “birthday of the martyr” as an annual memorial was a Christian adaptation of pagan custom. It played a crucial role in the cult of martyrs. Others among the early Church further advocated great veneration for martyrs whom they considered to be the treasures of the Church. Martyrdom was considered as a second baptism, the baptism of blood, which granted the martyr immediate remission of sin, entry into Paradise. The family’s martyrs who were imprisoned awaiting death, and even the town in which they resided, were held in high honor. Those who remained steadfast through imprisonment and torture, but escaped death, became among the elite society. This honor, moreover, gave them the privilege to the Episcopal office. It appears that the quite early, martyrs who were imprisoned were asked to pray for the health, well-being and salvation of the pious. It was natural; therefore, that such request for prayers be renewed after the martyr’s death. This controversial point no doubt led to an even greater tension between worship of the dead, a common practice in pre-Christian pagan society, and the veneration of martyrs. The cult of martyrs with its relics and shrines became an object of scorn to the Protestant Reformation. Hence the Catholic Church had to define again and again its theology of martyrdom. We shall close this section of our discussion with the words of the Council of Trent which met in part to answer the criticism of the Reformation. The holy bodies of holy martyrs, and of others now living with Christ ̶ which bodies were the living membrane of Christ and the temple of the Holy Ghost (I Corinthians 3:16), and which are by Him to be raised unto eternal life, and to be glorified ̶̶ ̶ are to be venerated by the faith full through which bodies many benefits are bestowed by God on men. While in Christianity a rich culture arose around the shrines and relics of the martyrs, in Islam this phenomenon remained limited to Shia Islam and even there it took both a different form and meaning. The wali (friend of God or saint) in Islam, whose shrine became a place of pilgrimage for the pious, was not required to be martyr. In fact, the Prophet recommended that martyrs should, whenever possible, be buried in the spot where they fell in battle.There are no shrines, to my knowledge, in the Muslim world except those of the Shia Imam in Iraq and Iran that were specifically erected as memorials for martyrs. Yet even here the Imams’ role is far greater than simply that of martyr. The word Shahid (witness), with all its derivatives, occurs over fifty times in the Quran. In most of these, the emphasis is on its linguistic meaning and usage as witness here on earth to the oneness of God, the apostleship (Prophet-hood) of Muhammad and the truth of the faith. However, we are concerned here with the shahid as martyr. It is important to observe that the shuhada (plural of shahid) are not a class in themselves. Rather, they are with the Prophets, the righteous (salihun) and truthful (siddiqun) of those who found favor with God. The first question that concerns us, then, is: Who is martyr? The answer, as we shall see, is in the end determined legally. We are told that a man asked the Prophet, “A man may fight in quest of booty. Another may fight for fame, and still another for a show of status. Who among these would be (fighting) in the way of God?” The Prophet answered, “Whoever fights in order that the word of God be uppermost, would be fighting in the way of God” the famous traditionist, Ibn Hajar al-‘Asqalani comments on this hadith: “One may fight for one of five reasons: booty; a show of bravery; or a show before others; in defense of wealth family, or land; and out of anger. Any one of these could in itself be praiseworthy or the opposite. So long as the main purpose remains that the ‘word of God be uppermost’ (which is here defined as defending the cause of Islam), it matters not what other reasons may exist as secondary causes” in yet another tradition, the Prophet was asked whether a man fighting for material rewards would also have a reward with God on the day of resurrection. The Prophet answered, “Nothing.” He continued, “God would not accept a deed unless it is done sincerely for Him and that the doer seek by this only His (God’s) face”. The application of the term “martyr” was not, at least in early Islam, limited to the person who is killed in the way of God on the battlefield. Martyrdom is an act of jihad (striving) in the way of God. Jihad, however, contrary to the common view held in the West, is not simply fighting. More basic is the jihad against the evil in one’s own soul and in society. It is this inner purity resulting from the jihad of the soul which creates the right intention (niyya) of serving the cause of truth in whatever way possible. Hence, besides dying in defense of faith, property or life, falling off one’s mount, dying of snakebite or drowning is regarded as martyrdom. Likewise, he who dies from a stray arrow or bullet, or if his house is demolished over him, is considered to be a martyr. Even those who die of the plague or a stomach ailment are considered as martyrs. A woman who dies in childbirth is also a martyr. The famous traditionist, Ibnc Abbas, is said to have declared, “A man died in his bed in the way of God, yet he is a martyr”. Yet in spite of all this, the true martyr is he who is slain in the way of God. It may have been that early traditionists feared the rise of a special cult of martyrs, so they used the term very broadly and with caution. Thus the Prophet is said to have declared, as related on the authority of Abu Hurayra, “whoever has faith in God and in His apostle, observes regular prayers and fasts the month of Ramadan, it shall be incumbent upon God to make him enter Paradise, whether he fights in the way of God or remains in the land of his birth.” Yet when the people asked if they should convey this glad tiding to others, the Prophet did not answer directly. Instead, he described the high station of the martyrs in Paradise. It is for this reason, perhaps, that it was the jurist rather than the orator or theologian who determined the principle according to which man or woman may be considered to be a martyr. We cannot enter here into this technical topic in detail; a few general remarks must suffice. Three categories of martyrs may be distinguished: shahid al-duniya (martyr of this world), shahid al-duniya wal-akhira (martyr of the world to come, only). The first is he who dies for a worldly cause besides that of faith. The second is he who is slain for no other reason but that “the word of God be uppermost.” Such a martyr is to be buried in his clothes without washing or shrouding, which are necessary rites of the dead. The martyr of this world is likewise buried in his clothes since in the end his motives are known only to God who would reward each person according to his acts and intentions. Finally, the Quran counsels Muslims to make peace among themselves. Yet if one party transgresses against another, then that group must be fought until it returns to the right. Thus, we are told, after the battle of Nahrawan (659 A.D.) against the Kharijites ‘Ali had the dead on his side buried as martyrs. The principle has continued to be observed, and often abused, to the present. 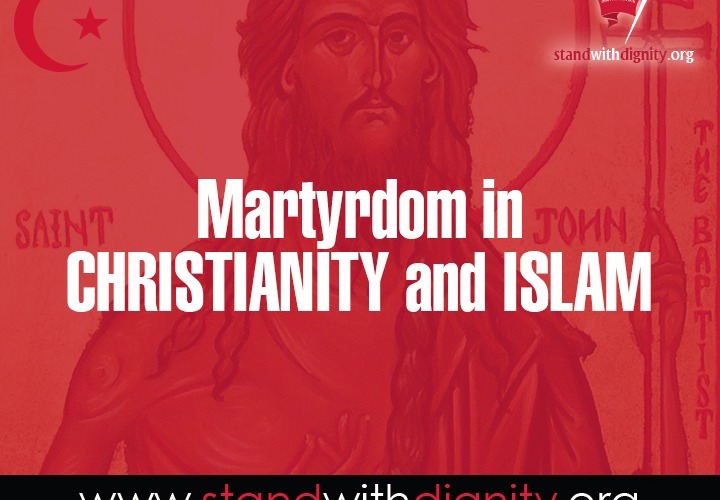 The blood of the martyr in Islam as in Christianity washes away his or her sins. It is important to observe that even though women are exempted from actual fighting for religious and juristic reasons, the first martyr in Islam was a woman, Sumayya, the mother of ‘Ammar b. Yasir, who was tortured to death with her husband and son by the Meccan Arab before the conquest of the city. The injunction to let the blood of the martyrs be their purification is said to have been given by the Prophet regarding those slain in the battle of Uhud. He said, “Shroud them in the blood and not wash them. For no man who is injured in the way of God but that he shall come on the day of resurrection with his blood gushing out his veins. The color shall be that of blood and the odor that of musk”. The martyrs, “those who are slain in the way of God,” the Quran tells us, “are not to be reckoned as dead; rather, they are alive with their Lord sustained”. Islamic eschatology has always been expressed in the language and the social framework of this life. Hence, tradition very early displayed great imagination in depicting the great pleasure of the martyrs in Paradise.Yet the true martyr for God retains his desire for martyrdom even over the Paradise. Malik b. Anas related that the Prophet said, “No one who enters Paradise would wish to return to this world, even if he were to possess all that is in it, except the martyr. He would desire to return to the world to be killed ten times because of the great honor (with God) which he sees in this act”. “The door of Paradise,” we are told in another tradition, “is under the glittering swords”. Tradition records numerous examples of martyrs who sensed the odor of Paradise on the battlefield and thus gladly met their death. One such example is that of a man called ‘Abdullah b. Jahsh who prayed on the morning of the battle of Uhud saying, “O God, let me today meet a strong and brave knight who will kill me and cut off my nose and two ears. Thus when I shall meet you tomorrow, you will say, ‘My servant, for what were your nose and ears cut off?’ I will then answer, ‘It was in You (for your sake), my Lord, and in Your apostle”. The death of Husain, moreover, became for Shia Muslims a source of redemption and healing. In a well-known hadith tradition, we are told that the Prophet said just before his death, “I am leaving with you (the Muslim community) the two weights (thaqalayn) onto which if you hold fast, you shall never go astray: the book of God and my family, the people of my household. They shall never be separated until the come to me at the Hawd (spring),” This paradisial spring, called Hawd al-Kawthar, shall be given to the Prophet on the Day of Judgment to quench the thirst of the pious “on the day of the great thirst”. Both the Quran and the family of Muhammad will judge and intercede before God and Prophet for those of the Muslims who honored the two weights or neglected and mistreated them. Husain will also stand before God on the day of resurrection as a headless body to contend with his murderers and intercede for his followers (Shia). For Shia piety it is Fatima, the daughter of Muhammad and mother of Husain, who has in her world embodied the suffering of her descendants and who continues to shed tears of anguish even in Paradise. This ethos of suffering stands in sharp contrast to the quick and spectacular success of the early generations of Muslims. Yet it is itself the product of that military and economic success. It comes out of the conviction the political justice must, in the end, reflect divine justice. God Himself, for Shia theology, is bound only by His own justice. Hence, Shia’s repeat daily in their worship the prayer, “O God, we desire of You an honorable state in which You honor Islam and its people, and humiliate hypocrisy and its people. (We pray) that in it you render us among those who call (others) to obedience to you, and that you make us leaders to your way.” This ideal order will come only when human justice will approximate most closely divine justice. This can only be achieved under the leadership of the Imam protected (Masoom) by God from error. In this hope, or rather humanly unrealizable goal, political idealism and theology meet. It is noteworthy that Shia, more than the Sunni majority of Muslims, have risked life and Muslim unity in this quest. They have, moreover, maintained a long and recognizable list of martyrs. The list begins with Abel (Qabil), and includes the Prophet Muhammad and all the Imams but one. The twelfth Imam, al-Qaim (he who is raised by God), will return to close this long chapter of wrong-doing and martyrdom. He shall establish justice in the earth. Thus the Prophet is said to have declared, “Even if there remains (only) one day of the life of the world, God will prolong that day until a man of my progeny shall appear, whose name is my name and whose agnomen (kunya) is my agnomen. He shall fill the earth with equity and justice as it has been filled with inequity and injustice.” This tradition, with minor variations, is accepted both by Shia and Sunni traditionists. Thus the ideal it expresses has gained official acceptance among Muslims of both groups. The verse just quoted goes on to say, “It is a promise incumbent upon Him in truth, in the Torah and the Gospel.” Thus Islam has from the beginning recognized the place and value of martyrdom in the major scriptures that were revealed before it. In an earlier surah of the Quran, revealed before the principle of jihad was established for the Muslim community, the Quran alludes to the famous Christian martyrs of Najran who became the subject of much exegetical and hadith scholarship. It is therefore important to ask in conclusion, what are some of the similarities and difference in the view of and attitudes towards martyrs in the two religious traditions. Perhaps the most obvious and important historical difference is that while in Christianity martyrdom was a glorious struggle before Christendom became a world power under Constantine, in Islam the jihad, or struggle of the martyrs, was instituted after Islam became a religious, social and political order. Thus, when the symbol of supreme martyrdom, the cross, became the banner under which political wars were waged, the significance of the principle altogether became subject to question and doubt. The most intense protest against this “distortion” may be seen in the radical Reformation and the rich and moving metrologies which Mennonites and Anabaptists left as their legacy for posterity. The ideal martyr in Christianity was therefore he “who suffered strips, imprisonment, crucifixion and wild beats….” Is it because of this loss of the original meaning of this ideal that even among committed fundamentalist Christians, martyrdom is no longer the impetus it was for the early Church? In Islam, the ideal martyr is he who strives in the way of God “with his hand, with his tongue and with his heart.” Yet striving only with the heart is considered to be “the weakest of faith.”41 this ideal does not imply wild and uncontrolled warfare. It is rather a regulated struggle for the good and against evil; at any rate that is what is enjoined in the Quran and hadith tradition. This struggle has definite priorities of concern. “If affliction (bala) befalls you,” advised ‘Abdullah b. Jundub, the son of a well-known Companion, “ransom your souls by your wealth. But if affliction increases, put your souls before your faith. For a truly deprived man is he whose religion is taken away from him. This is because there is no poverty (faqah) after Paradise, nor is there any wealth after the fire”. In spite of this important difference, however, both Islam and Christianity agree on the basic concept of martyrdom as witness to the truth. They also agree that the true martyr is he who is free from any other motive but that witness. While the ideal martyr in Islam is the one who falls on the battlefield, actual fighting is not an absolute requirement for martyrdom. Islam, moreover, has its martyrs who silently and bravely endure torture and death. Finally, both traditions agree regarding the exalted station of the martyr with God and that the martyr will carry the marks of his sacrifice with him to be displayed even in heaven. In more recent Christian developments, the two ideals may yet have more in common than ever before. Liberation theology, which is the product of poverty, piety and political awareness, may yet prove to be the most important phenomenon in modern Christian history. As a Muslim, I do believe that piety without political involvement is at best all theory and no practice. It shall be those who feed the hungry, clothe the naked, care for the sick and defend the wronged in prison who will inherit the kingdom of God. I John 1:1, All Biblical quotations are taken from the Revised Standard Version. See also Acts 1:8, Luke 21:13, John 15:27, and Matthew 10:28 where the term “martyr” is also used in the sense of witness. Revelation 17:6 see also 6:9-11 and 20:4. Cyril C. Richardson et al. (eds. ), Early Christian Fathers, the Library of Christian Classic. (Vol. I). The Westminster Press: Philadelphia 1953, p.46. See Roman 6:3, and entire Epistle which revolves around this concept. See “The Martyrdom of Polycarp”, Richardson et al (eds. ), pp. 149-158. The New Catholic Encyclopedia, vol. 9. 1967 .p. 312.